An octagonal gazebo from Forever Redwood is all you have been missing to make your outdoors more appealing, comfortable and fun to spend time at. This beautifully crafted octagonal gazebo is designed from only restoration forestry wood, guaranteeing sturdiness and long-term service. It features a stylish finishing that not only adds pomp and colour to your outdoor décor, but also brings new life and energy to your back or front yard. It is the perfect addition to your home and can serve as a haven for get-togethers, quiet outdoor reading space, perfect spot for a Jacuzzi, and more. So, how can this octagonal sunroom gazebo complement your home? The world today is very busy and demanding. Having a place that offers extemporary outdoor comfort to relax and have a reflection about life is therefore all too important today. The Regal Sunroom gazebo is the perfect spot for such relaxation. Fitted with multiple doors that swing open to let in fresh air and give you a fresh aesthetic feel for your front or backyard, this gazebo is a wonderful way to recharge your batteries. Spending time and doing activities such as dining indoors can become monotonous. This gazebo helps you break that monotony. The fact that the octagonal gazebo can be closed or open gives it an edge over other types of gazebos on the market. When it's cold outside, you can still take your partner or family for an outdoor gazebo dinner because you have doors to keep you warm inside. When there is mild sunlight, you can bask in the gazebo as the windows will let in plenty of sunlight. And when it's too hot, just open the doors and ventilation to keep the inside cool. 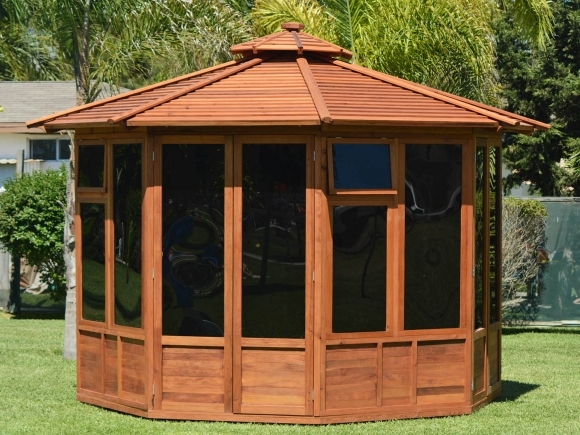 This stylish octagonal sunroom gazebo from Forever Redwood can provide the perfect place for outdoor entertainment. Be it family gatherings, intimate evenings, playing board games, or even just having drinks and telling stories, this elegant garden structure is built for it all. Entertain your guests here all night with plenty of activities that you can engage in and make their visit unforgettable. It is fully customizable and comes in any size you want, up to a diameter of 16 feet. The octagonal sunroom gazebo provides the right amount of privacy and protection from weather elements, helping you enjoy your hot tub experience even better. If you intend to use your octagonal gazebo for this purpose, be sure to take the right measurements before you order a shipment to ensure perfect fitment. Contact Forever Redwood today for your piece of the cake! Assured customisation for your size and budget needs, and UK shipping available.